Lith Harbor is the first town a new player arrives in from Maple Island. It is a coastal town that appears to have a lot of fishermen and sailors. Lith Harbor is located on the Southwestern corner of Victoria Island. The monsters surrounding it are very weak. There are also a number of beginner quests here, mostly concerned with picking a job. It is a small town that loses its importance as a player progresses in level. 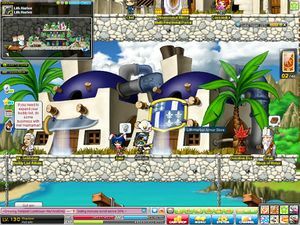 In some versions, a blue chair can be purchased in the shop that allows a player to regain HP over time. Players can go to Rien from here. The Big Bang patch has interlinked all the cities and towns in Victoria Island via Six Path Crossway. The boss of Lith Harbor is Mano, the grandfather of all snails, available in all versions. It is the largest snail, and presumably their leader. It respawns quickly and has the ability to summon more companions in the form of Red Snails, Blue Snails, and Green Snails to aid him. In JapanMS and ChinaMS, players can return to Southperry from here. But only the players with 300 or more fame can in JapanMS. As of the Big Bang patch, all major towns in Victoria Island are connected via the Six Path Crossway. The Station Platforms for Ereve, Orbis, and Edelstein are also located here. You can also access Singapore from here in some versions. This page was last edited on 23 November 2018, at 01:21. This page has been accessed 41,599 times.